Nux vomica is the homeopathic remedy that is created from the seeds of the strychnos nux vomica tree. Also known as poison nut or vomiting nut, this tree is an evergreen tree that is native to East India, Burma, Thailand, China, and Northern Australia. 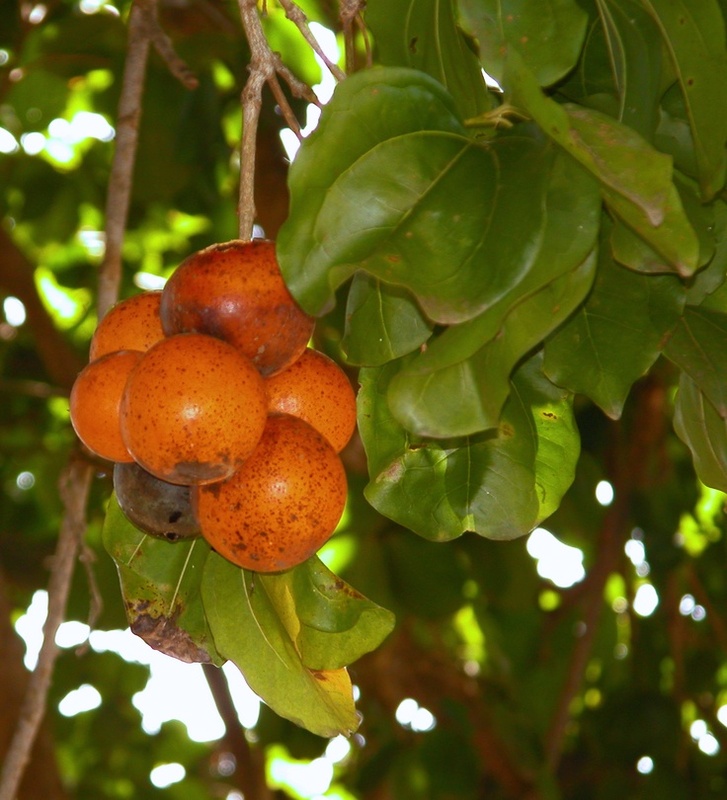 The tree belongs to the Loganiaceae family and has small flowers and orange colored fruits that are the size of an apple or orange. Inside the fruit are five seeds surrounded by a jelly-like pulp. 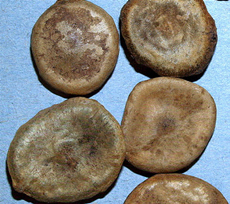 The ash gray seeds are round and measure 1 in (2.5 cm) in diameter and are .25 in (0.6 cm) thick. The seeds are coated with downy hairs that give them a satiny appearance. The main alkaloids in the seeds are strychnine and brucine. These alkaloids give the seeds their bitter taste. Strychnine by itself is extremely poisonous, but when given in small doses to humans it promotes appetite, aids digestion, and increases the frequency of urination. In the nineteenth century it was used as a central nervous stimulant. In larger doses, however, strychnine produces a loss of appetite, hypersensitivity, depression, anxiety, and rigidity and stiffness of arms and legs. Toxic doses may cause convulsions and death. Some historians think that Alexander the Great died from drinking wine poisoned by strychnine. Medicinal use of the nut dates back to the middle of the sixteenth century, where it was written about extensively by Valerius Cordus. Germans used the nut as a treatment for worms, rabies, hysteria, rheumatism, gout, and as an antidote for the plague. Nux vomica is one of the most frequently used homeopathic remedies, especially for acute conditions. Homeopaths prescribe this polychrest for hangovers, back pain, digestive problems, headaches, allergies, colds, flu, emotional stress, constipation, menstrual problems, and hemorrhoids. Nux vomica affects the nervous system. When taken by a healthy person the remedy causes muscle spasms and cramps, and even convulsions. It affects all five senses and bodily reflexes and causes extreme sensitivity to light, touch, noise, and smells. The remedy is primarily indicated in ailments that are caused by abuse of narcotic drugs, alcohol, coffee, or tobacco, overindulgence in rich food and drink, and mental strain brought about by too much work. Nux vomica patients are typically thin and dark-complected workaholics who wear themselves down by working late, eating heavily, neglecting exercise, and overindulging in moodaltering foods such as coffee or alcohol. They are hurried and have an overactive mind, even at night, which is why they often suffer from insomnia. Their digestive systems are weakened by the rich, spicy, stimulating food and drink they crave and consume. As such, they suffer from diarrhea, constipation, hemorrhoids, digestive problems, and an overall weakened vitality. Nux vomica patients catch colds easily and are hypersensitive to light, touch, noise, smells, and the effect of medicines. They are also sensitive to the cold and dislike cold weather immensely. Patients may be tidy and fastidious. Children who require nux vomica are mischievous, stubborn, sensitive, and easily offended. They like to get their own way and become difficult if they do not. Mentally, nux vomica patients are irritable, impatient, jealous, suspicious, malicious, never satisfied or content, anxious, argumentative, critical, stubborn, and rude. They have a violent temper and are often suicidal. They also have a difficult time concentrating and their memory often fails them. Physically they may suffer from muscle spasms and twitching of muscles, emaciation, anemia, internal muscle tension, numbness of the affected part, an ineffectual urge to urinate, cramping pains, and heat in the stomach, chest, uterus, head, face, and palms of the hands. The complaints are generally right-sided, especially in conditions of tonsillitis, hernias, and renal colic. Symptoms are generally worse in the morning, at night (particularly after midnight or from 3:00 to 4:00 A.M.), in cold or open air, in dry weather, after eating, from cold food and drinks, from lying down or lying on the painful side, during the menstrual cycle, from mental strain, loss of sleep, and from use of alcohol, coffee, and tobacco. Symptoms are better with warmth, warm food and drinks, wet weather, and sleep. The headaches indicative of nux vomica are concentrated in the forehead (over the eyes) or back of the head. The pains are sharp, bursting pains and the scalp may feel sore and bruised. Constipation and other gastric symptoms are often present. This headache is typical of a hangover headache. It may be caused by alcohol, cold wind, damp weather, insomnia, mental strain, or overeating. The headache is aggravated by eating, cold air, moving the eyes, or shaking the head. Stillness and quiet relieves the headache, as does pressure, rising in the morning, or lying in bed at night. The nux vomica cold occurs as a result of exposure to cold, dry wind or from indigestion. Colds generally settle in the nose, throat, chest, and ears. Colds are accompanied by a hoarse voice, headache, sore throat, sneezing, chills, a tickling cough, fever, and bone pains. The voice sounds nasal from the stuffy nose, which is plugged in open air and at night. The nose emits a watery discharge during the day and in a warm room. The patient has a desire for cold water and the eyes are watery. Colds are better from fresh air and worse upon rising in the morning and after eating. The earache that accompanies the cold is made worse by swallowing. The ear is itchy and painful. Flus and hay fever both exhibit the nux vomica cold symptoms. The flu may be accompanied by an aching, sore sensation. The hay fever may last throughout the year. The cough is a dry, tickling cough that comes about in violent fits. It is accompanied by headaches, a sore throat, and pain in the abdomen. Coughs are worse after midnight, from mental exertion, in cold air, and after eating. They are relieved by hot drinks and from fresh air. Sore throat pains spread to the ears. The throat is raw and the patient may feel as though there is “a lump in his throat.” The sore throat is worse from swallowing and cold air. Fever is accompanied by chills, shivering, and an aching of the back, arms and legs. The fever begins early in the morning around 6:00 or 7:00 A.M. The fever is hot and dry and is often one-sided. The patient becomes chilled when he moves around in bed or when a limb becomes uncovered. He is thirsty and may perspire. The gastric symptoms typical of this remedy may occur with the fever. Digestive complaints are brought about by overindulging in rich, spicy foods, alcohol, tobacco, or coffee. Disturbances include diarrhea, constipation, and abdominal pains and may be accompanied by nausea, vomiting, and indigestion. The patient feels bloated and full. The abdomen is painful and cramped and the patient may be doubled over. He may strain to urinate, defecate, or vomit. The pains are relieved by passing gas or passing a stool, from hot drinks, loose clothing, and warmth. Menstrual difficulties occur throughout the cycle. The period is early, late, or too long. The menses may be heavy and clotted and accompanied by back pain and violent cramps that are aggravated by air or the cold and relieved by warmth and pressure. Insomnia is caused by excitement, mental exertion, or the effects of alcohol. The patient is sleepy but as soon as her head hits the pillow she is awake. She often wakes up early in the morning, around 3:00 A.M., and cannot get back to sleep. Gastritis. Studies were done as early as 1966 comparing patients who received nux vomica 4X for gastritis compared with a group that received a placebo. While one study showed that twice as many patients responded to the homeopathic remedy as responded to the placebo, other studies found no difference in the rate of response. Alcoholism. A study published in 2001 reported that nux vomica reduced alcohol intake in rats that had been conditioned to crave alcohol. The rise in the number of animal studies using nux vomica, however, has led to some debate among homeopaths regarding the morality of experimentation on animals. Abnormal psychology. The compilation of the Constitutional Type Questionnaire, or CTQ, as a homeopathic psychological research instrument has led to studies comparing its findings to those of mainstream psychological measures. One group of researchers reported that subjects who fit the nux vomica profile on the CTQ scored high in neurotic traits as well as high in chemical intolerance. The seeds of the tree are ground until powdered then mixed with milk sugar. This solution is then diluted and succussed to create the final preparation. Nux vomica is available at health food and drug stores in various potencies in the form of tinctures, tablets, and pellets. If symptoms do not improve after the recommended time period, a homeopath or healthcare practitioner should be consulted. 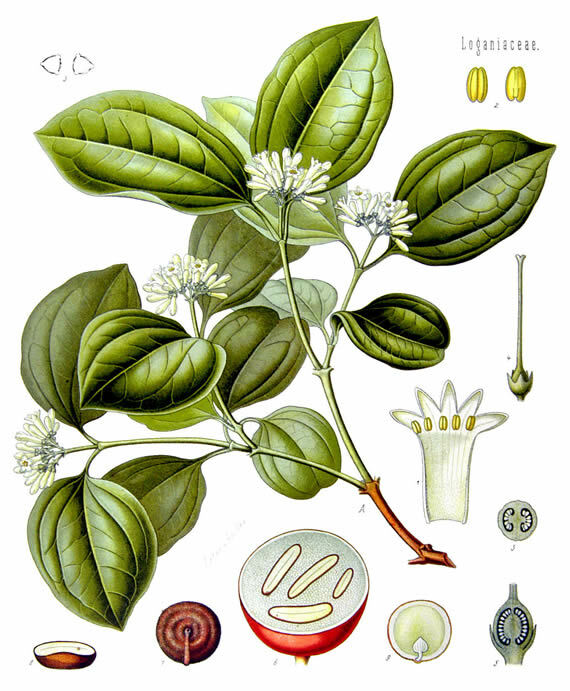 The recommended dose should not be exceeded, as the strychnine in nux vomica is poisonous. People should be careful to use only preparations made by established manufacturers, as cases of accidental strychnine poisoning from non-homeopathic herbal preparations containing nux vomica have been reported. There are no known side effects at recommended dosages, but individual aggravations may occur. When taking any homeopathic remedy, use of peppermint products, coffee, or alcohol should be avoided. These products may cause the remedy to be ineffective.